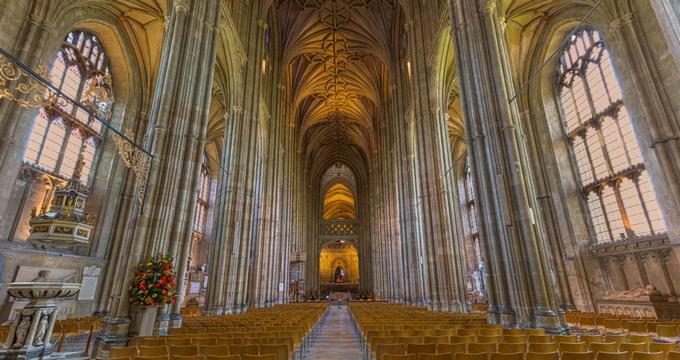 Canterbury Cathedral not only stuns guests with its beautiful and historic architecture, but also inspires them with the way that religion seemingly oozes out of its pores. Guests should play to be awed as well as to learn about the history of religion in England in a place that traces its roots back to 1070. One of the oldest Christian structures still standing in England, the cathedral (located in Canterbury, United Kingdom) is now the Mother Church of Anglican Communion and the Archbishop of Canterbury’s seat. It is part of what is considered a World Heritage Site (a landmark selected by the UN for its historical significance). It continues hosting religious services as well as pilgrimages (attracting people from all over the world) to this day. Guided Tours - Take a tour of the grounds with an expert tour guide, well versed in the history of Canterbury. This is the preferred way of touring the cathedral and the best way to make sure guests do not miss anything. Audio Tours - If visitors would prefer to do a self-guided tour, audio tours are available in seven different languages (Dutch, French, English, Spanish. German, Japanese, and Italian). This tour lasts about 40 minutes, with another optional 20-minute add-on covering the Chapter House and the Great Cloister. Guide Books - For visitors who really want to do it themselves, guide books are available. Featuring a 24-page step by step walking guide, guests can pick one up and then keep it as a souvenir afterward. Great West Window - Make sure to check out the stained-glass collection, especially Adam Delving as it is one of the oldest in the cathedral. The Martyrdom - This area marks the spot where Thomas Becket is said to have been murdered in 1170, leading to the pilgrimages that continued to this day. The Great Cloister/Chapter House - Here lies the center of the monastic life of the cathedral. Make sure to look up! The Crypt - Also known as Saint Gabriel’s Chapel, this building displays the oldest “Christian” murals in England. The Quire - The first building built in the Gothic style was built after the fire in 1174, by an architect from France who actually died on the job. Miracle Windows - These beautiful stained-glass windows portray a few of the miracles that have been reported to have occurred after Thomas Becket was murdered. The Candle - This candle pays tribute to St Thomas’s tomb, which was ordered to be burnt down and destroyed by King Henry (the VIII) in 1538. Saint Augustine's Chair - This chair is the marble enthronement chair for the ceremony crowning the Archbishop of Canterbury. Tomb of the Black Prince - Visit the burial place of Edward of Woodstock, one of the most well-known military leaders in England’s history. He has been buried here since 1376. Water Tower - Built for monks set bathing times in the 12th century, the water tower was advanced for its time (with lead pipes that drew water from a nearby spring). School group field trips are always welcome at the cathedral. When considering a visit, teachers are strongly urged to contact the department in charge of scheduling (Schools Department) to inquire about available times and dates as well as to discuss possible learning objectives and discuss cost involved. Visits are catered to grade level of the students, with specific tours for primary school, secondary school, and even overseas school. There is downloadable information available on the website for teachers to view prior to visiting as well, with helpful information as well as behavioral guidelines to discuss with the class ahead of time. There is a lunch room available, although it is reserved mostly for primary school class usage. It is also recommended for teachers to fill out a risk assessment ahead of time, which is available on the website. Tours are expected to last around an hour to an hour and a half, but classes are welcome to stay as long as they would like to complete their educational goals. The Cathedral gift shop, located on the premises, offers a large range of gift options at low prices. Offerings like glass sculptures, stuffed animals, notebooks, candles, calendars, and books related to the history of the cathedral. All proceeds go directly back into the care of the Canterbury. There is something for everyone!